How To Gracefully Tell Someone, "Get To The Point!" When’s the last time you wanted to shout at someone, “GET TO THE POINT!” We’ve all found ourselves on the receiving end of someone’s long drawn-out explanation or story. Maybe in these situations, you’re able to maintain your friendly and interested composure. Yet, your internal dialogue doesn’t quite match. There’s a whole other conversation going on in your head of things you’d like to say but don’t. If you’re anything like me, you might be saying to yourself, “Please get to the freakin point already!” Of course, it’s a terrible idea to say this to a client. It’s also not a great rapport builder with the important people in your life even when you have more leeway to make these types of requests. One of the blessings and sometimes curse of my work in Neuro-Linguistic Programming (NLP) is that I learned how to help someone without needing every little detail. I usually only need the basic information and the non-verbals (eye-accessing cues, body language, etc.) in order to get to work. This is a blessing because the process can be quick and yet powerful. The curse is that I start to lose patience with someone when they drone on and on. When someone can get to the point quickly, it’s much more satisfying for the listener. Unfortunately, many people struggle to articulate their thoughts. Depending on their thinking strategy, it may take some time to get the words out. As an entrepreneur one of my most precious resources is time. That’s likely the same for you. We all have the same finite number of minutes each day. When someone’s eating up your coveted minutes you’ve got to be ready to put a stop to it. 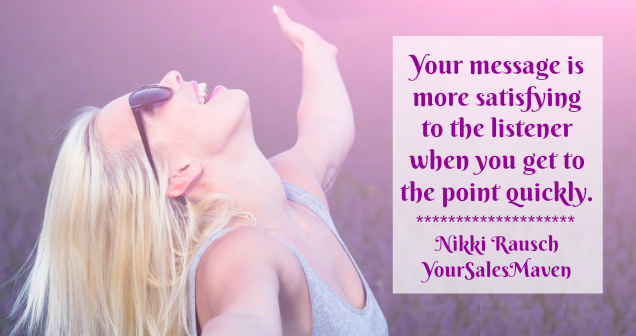 Yelling, “Get to the point” is rarely an appropriate response. The last thing you want is to leave someone feeling shamed and/or thinking you’re a total jerk. Instead, gracefully help them get to the point by using a simple statement. You’ll be able to say this and maintain rapport at the time time. By attaching a time frame, you give the other person some boundaries to try to stay within. This statement implies that you’re still engaged AND that may change once the time frame expires. They’re much more likely to prioritize what they’re saying and be more succinct. Keep in mind, the person may decide that every detail is important. You might not save yourself much time with the less direct statement. Give it a try and see how people respond. When you get a positive response, notice what tone you used and your body language. Using that same tone and body language the next time around will likely get you the same positive results.